The marrow is basically a vehicle for the lemon and the ginger. 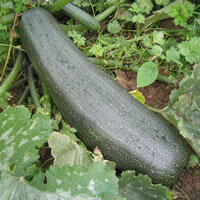 Marrows deepen in colour when stored, so jam made late in the season will be darker than any made earlier. Place the marrow flesh in a large, heavy-based or preserving pan and pour on a little cold water. Bring to the boil and simmer for about 20 minutes, until tender. Drain thoroughly and mash the flesh. Return the marrow to the pan and add the grated rind and lemon juice. Add the ginger. If using root of dried ginger, place it in a muslin bag and bruise it thoroughly with a hammer before adding. Bring to the boil, remove the pan from the heat and add the sugar, stirring until dissolved. Put the pan on the heat again and boil for about 20 minutes or until the jam is thick. If using root of dried ginger, remove it before potting. Pot and seal.